Shutters should never be mounted directly to the wall – a gap between the wall and the shutter is necessary to allow air to circulate behind the shutter so trapped moisture does not prematurely rot your shutters or siding. Shutter hardware is highly recommended in all installations because it allows more air circulation behind the shutter and allows you to maintain both your shutters and your siding thereby increasing the life of both your shutters and siding. In a fixed mount installation, shutters are permanently screwed or nailed to the structure. This method of installation, though very common, is not recommended because debris, insects and moisture become trapped behind the shutter. Since the shutter is not moveable, it cannot be cleaned and maintained. If this method is chosen, a 1/2” to 1” standoff is recommended to space the shutter away from the structure. A decorative installation is ideal in installations where shutters will not be opened and closed. Decorative installation of hardware allows the hardware to be seen when the shutters are in the open position. Shutters can swing away from the wall so that the shutters and siding can be cleaned and maintained properly. 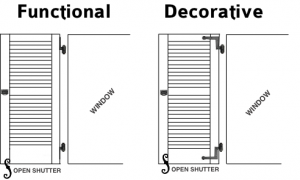 A decorative installation may not allow shutters to close fully. Routine maintenance will dramatically lengthen the life of both your shutters and siding. A functional installation allows shutters to be opened and closed as shutters were meant to operate. With a functional installation, only the pintle and a very small portion of the hinge are visible when the shutters are open. Hardware is fully visible when the shutters are in the closed position. One mid hinge should be used with all shutters with a height greater than 48 inches. An additional mid hinge should be used on shutters with a height greater than 96 inches.